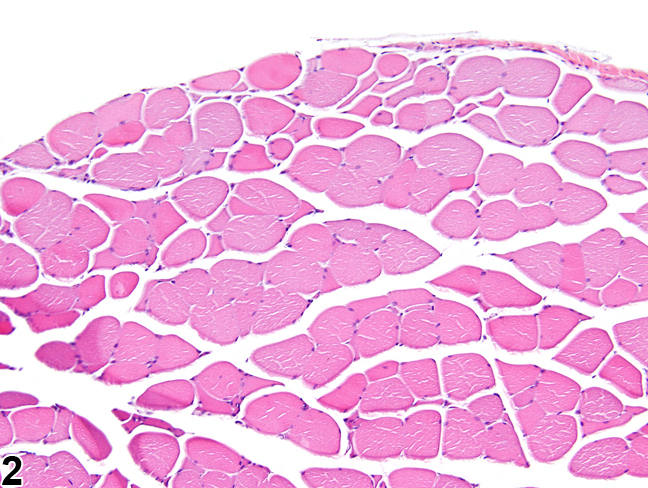 muscle - Atrophy in a male F344/N rat from a chronic study. Individual hypereosinophilic muscle fibers of reduced diameter are sometimes surrounded by clear spaces. 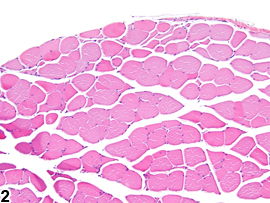 Skeletal muscle - Atrophy in a male B6C3F1/N mouse from a subchronic study. Note the reduction in myofiber diameter of the affected fibers (top) compared with the more normal myofibers along the bottom. Skeletal muscle atrophy can occur due to degenerative processes originating within the skeletal muscle fibers, secondary to denervation (denervation atrophy), or spontaneously in aging rodents. It is a common reaction to any injury that results in the degradation and/or loss of myofiber organelles. Examples include disuse, cachexia, nutritional or metabolic derangements, vascular insufficiency, disturbances of hormonal growth control mechanisms, and administration of myotoxic xenobiotics. Compensatory hypertrophy of surviving/unaffected myofibers is often present concomitantly, regardless of the cause. The main histologic feature of skeletal muscle atrophy is a reduction in myofiber diameter ( Figure 1 and Figure 2 ). Affected myofibers are often rounded to angular with hypereosinophilic sarcoplasm. 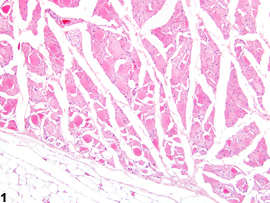 In denervation atrophy, the characteristic histologic feature is that of compressed angular myofibers with crowded nuclei. Atrophy due to nonneurogenic causes, such as that induced by the administration of myotoxic xenobiotics, often lacks these fibers and is instead accompanied by traditional myopathic changes, such as necrotic or hyalinized myofibers, split or fragmented myofibers, and myofibers with central nuclei. Spontaneous atrophy of aging rodents (often referred to as hind leg myopathy) is histologically characterized by decreased myofiber size and number; increased myofiber size variation; increased accumulation of degenerative inclusion bodies, lipofuscin, and lipid droplets; and increased connective tissue. Angulated myofibers are often present, suggesting a possible role of spinal degeneration within this process. However, spinal nerve lesions are not consistently observed in all affected animals; the pathogenesis remains unclear. This condition is predominately noted in the hind limbs of affected rats. It has been described in several strains of rats, including Wistar and Sprague-Dawley, but has not been recorded in the F344 rat. Atrophy can uniformly affect myofibers or selectively target specific muscle fiber types. Type II fibers are selectively affected when atrophy is associated with disuse, cachexia, or malnutrition. Chronic administration of corticosteroids in rats results in the selective atrophy of type II fast-twitch fibers. Conversely, type I fibers are selectively targeted during experimentally induced thyrotoxicosis. When present, skeletal muscle atrophy should be diagnosed and graded. Compensatory hypertrophy of unaffected fibers does not need to be recorded separately unless warranted by severity. Potential causes of the atrophy (e.g., primary degeneration, secondary to denervation, or spontaneously in aging animals) should be discussed in the pathology narrative. The histologic appearance of the affected myofibers, specifically regarding the presence of angulated myofibers, should be included in the narrative. When warranted by severity, additional myopathic changes, such as myofiber necrosis or degeneration, should be recorded and graded separately.